While cheaper cameras available to users are becoming more versatile devices, there are some manufacturers who are more traditional in recent releases. One of these examples is Leica, the conventional camera brand that despite the demands of the market, it always surprises us with excellence, but also with high prices. 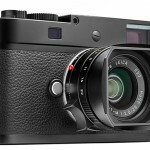 In this article we will be talking about its latest release: the Leica M-D Typ 262. Shall we delve more into the characteristics of this device? One of the most relevant aspects of the Leica M-D Typ 262 is that it embodies the entire concept of Leica on a single camera. Precisely because its main focus is doing photography, rather than giving the user edit or even review the photos it on a screen. It only allows the user to modify certain technical parameters such as openness, ISO sensitivity, and others. It is truly an almost blind experience, but always offering the best possible image quality. The camera focuses basically in making use of manual mode by the user, at the highest order. It forces the photographer to trust in their abilities and focus on getting the best picture. To offer a better chance of achieving a correctly focused photograph, the Leica M-D Typ 262 incorporates a viewfinder and a rangefinder. And since it is a Leica camera, perhaps we don’t need say that the quality of the photos (because it only takes photos) is fantastic. Although it does not offer any video capabilities and a screen to display the results, the clearly delivers and does not disappoint the photographer. Thus, we proceed to explore these features in more depth. Photo sensor: To offer cleaner, and more precise results, the Leica M-D Typ 262 has a full format CMOS MAX photo sensor, with a high resolution of 24MP. Next to the heart of the camera, is a master image processor, which is in charge of giving the user a vivid image with the least possible amount of digital noise, with the most vivid and true color to the original scene, and of course, with the highest degree of accuracy possible. These two mechanisms together also contribute to the system of continuous shooting at a frequency of 3fps or 2fps when using a single exposure mode. Also, you can shoot up to eight consecutive frames to get the greatest amount of images of the same scene. Optical viewfinder (Rangefinder). The main attraction of the Leica M-D Typ 262 is that it incorporates both an optical viewfinder and a rangefinder to give the picture a better focus. The viewfinder is large and bright, with 0.68x magnification and automatic compensation of Parallax and framing lines, which are designed to match with the size of the sensor when focusing from a distance of 6.6’. The mechanism of this rangefinder is to display separated or superimposed images in the center of the viewfinder to benefit a clear manual focus control. As we said, this camera is designed to give the user ease to work in manual condition. Analog dials. Rather than incorporate an LCD screen to display the images and adjust them this way, the Leica M-D Typ 262 incorporates a few dials that are both in the back and on the top of the camera instead. You can use them to adjust the ISO sensitivity easily, take exposure up or down a few notches and set the shutter speed from 1/4000 and up to eight seconds of exposure. Bulb mode, on the other hand, can be adjusted to remain active for 1 minute. These are really long exposures! Aperture control works with any lens that you couple with this camera, as long as it fits the M standard. Aperture priority mode can also be used together with the exposure meter. Physical design. Camera has a quite particular look and it is quite similar to that of the Leica M Typ 262 model. You could even consider it a more minimalist and simple version of that one that happens to include a rangefinder. The camera comes in a completely black presentation. 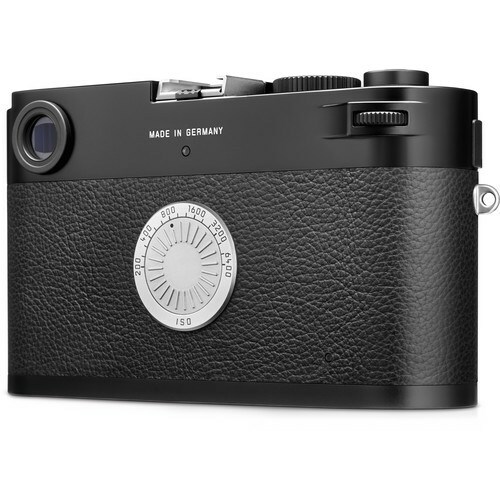 It does not even include the red Leica dot (part of its logo). In addition, as mentioned in the previous paragraphs, the Leica M-D Typ 262 lacks an LCD screen on the back and rather this has been replaced with the ISO sensitivity dial. Due to the omission of a monitor, you can’t use it to take video, and is focused on ensuring the photographer an entirely classical experience. Virtual automated functions available in other Leica models and other recent cameras in general, are also notably absent in this device. It is also important to note that the camera is waterproof thanks to its aluminum and magnesium construction. 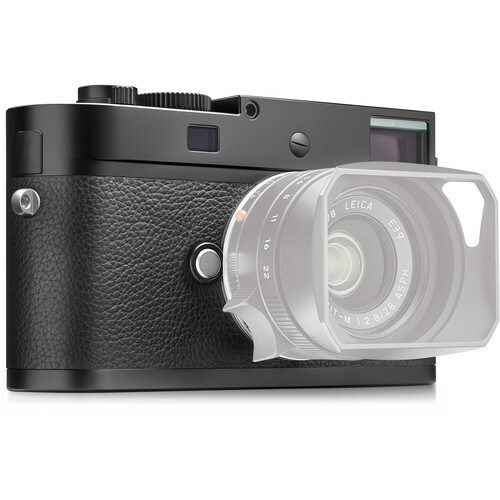 Of course, apart from being tough, Leica added a black synthetic leather texture all over the camera. The camera shutter. In addition to being a discreet camera in terms of dimensions, it is discreet in the adjustment of its parameters as well. The Leica M-D Typ 262 offers the possibility of adjusting a silent shutter to benefit photographers who require discretion when capturing pictures of wildlife, street photography and others. Camera compatibility. The mount of the camera is compatible with a wide range of lenses available on the market, including those that incorporate rangefinder features, between 16mm and 135 mm focal lengths. Unique photograph format. To maintain excellent picture quality, the Leica M-D Typ 262 saves all photos in DNG format. The JPG format is not available. Adobe license. As a nice touch, the price of the camera includes a gift for the photographer, which is a full Adobe Photoshop Lightroom license, which is the perfect software to edit images in post-processing. Like all Leica cameras, the Leica M-D Typ 262 is no exception: even though the camera is not available, it will be very soon, which is the end of the good news. However, the device will have an approximate price of 5000 dollars (not including a lens), which is the bad news.